Navy Cmdr. Michael C. Holifield, a 1989 graduate of Washington and Lee, was nominated for the 2011 Outstanding Career Armed Services Attorney Award for outstanding achievement. He received the recognition for the superior performance of his duties as a Navy judge advocate while assigned as staff judge advocate, Navy Region Southeast, Jacksonville, Fla. In 19 years of Navy service, Mike has performed 15 assignments, which have garnered him many awards and honors. He has also helped train more than 100 judge advocates. After graduating from W&L with a degree in philosophy, Mike went on to the Indiana University School of Law, where he earned his J.D. Mike’s particular expertise is in the law of the sea, and he is head of the Law of the Sea Department for the Office of the Judge Advocate General. 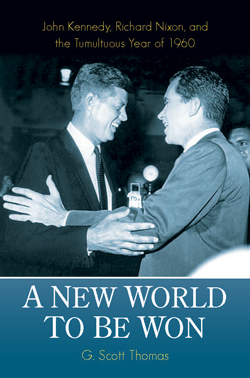 In November 2009, Mike spoke on that topic at an event hosted by The Pew Charitable Trusts and Belmont University. Scott, who majored in journalism and communications, is projects editor for a national chain of business publications, American City Business Journals. He writes ACBJ’s daily demographics blog, On Numbers, which uses data to provide a daily glimpse of American society with recent stories highlighting the communities with the richest populations and citing the minor league baseball teams with the highest attendance. His previous titles includes Advice From the Presidents (2008), Leveling the Field: An Encyclopedia of Baseball’s All-Time Great Performances as Revealed Through Scientifically Adjusted Statistics (2002), The United States of Suburbia (1998), The Rating Guide to Life in America’s Fifty States (1994), Where to Make Money (1993), The Rating Guide to Life in America’s Small Cities (1990), and The Pursuit of the White House (1987). 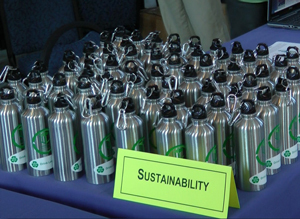 W&L’s University Sustainability Committee (USC) has provided all new students — both undergraduate and law — with a stainless-steel water bottle, emblazoned with a “Drink Local Water” logo, as part of the committee’s promotion of sustainability on the Washington and Lee campus. The USC aims to educate not only entering students but also returning students, faculty and staff about the advantages of tap water over bottled. The accompanying materials note the connection between the health of the Maury River and the water that campus community members drink and shower with. Lexington’s water comes from the Maury River upstream of Lexington. The Maury Service Authority’s water-treatment plant filters, chlorinates and fluoridates the water and distributes it to Lexington and portions of Rockbridge County. The E.P.A. sets water-quality standards that municipal water systems must meet, and reports on Lexington’s water are public. According to the USC, the cost of local water in Lexington, including sewer charges, starts at 1 cent per gallon and increases with higher consumption. By comparison, bottled, imported Fiji water costs $7.54 per gallon. The Drink Local Water program is related to the local-food movement that W&L’s Dining Services has championed and for which it continues to gain statewide recognition. W&L will join the University of Virginia, Virginia Tech, the Virginia Food System Council and the Virginia Cooperation Extension as co-hosts of the 2nd Virginia Food Security Summit, to be held in December at U.Va.’s Alumni Hall. More details will be available closer to the event. Jeff Shay, the Johnson Professor of Entrepreneurship and Leadership at Washington and Lee, appeared on NPR affiliate WMRA’s “Virginia Insight” radio show on Monday, Sept. 19, to discuss key lessons for small-business success. 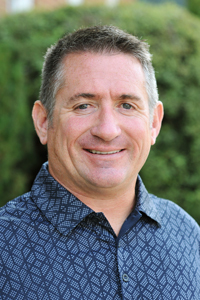 An entrepreneur himself when he was in his early 20s, Jeff has more than 20 years of consulting experience through his company, Shay Consulting International. He provides these services in order to keep current with the practical application of what he teaches. 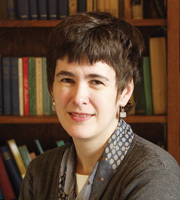 Congratulations to Lesley Wheeler, the Henry S. Fox Professor of English at Washington and Lee. She is one of three finalists in the poetry category of the 2011 Library of Virginia Literary Awards, for her book Heterotopia (Barrow Street Press). Lesley, in fact, won a prize for the volume when it was still in manuscript, the 2009 Barrow Street Poetry Book Prize. We blogged about it at the time; you can read it here. Heterotopia is Lesley’s second book of poetry. For the poetry award, judges selected three finalists out of a pool of 24 nominees. The Library of Virginia will bestow the Literary Awards on Oct. 15. You can read more about them here. Lesley and her family, which includes her husband, Chris Gavaler, visiting assistant professor of English at W&L, recently returned from six months at Victoria University in Wellington, New Zealand. Lesley worked there under the auspices of a Fulbright Scholar senior research grant. It’s not the first time the library has recognized W&L faculty members for their literary talents. Rod Smith, editor of Shenandoah, won the poetry prize in 2002 and 2008 and was a finalist in 2004; Dabney Stuart, professor of English emeritus, was a finalist for fiction in 1998 and the winner for poetry in 2006; and Domnica Radulescu, professor of Romance languages, won the fiction prize in 2009. Alumni have won recognition too. In 2007, Tom Wolfe, of the Class of 1951, received the library’s Lifetime Achievement Award. Art Goldsmith, the Jackson T. Stephens Professor of Economics at Washington and Lee, appeared on NPR affiliate WMRA’s Virginia Insight show Thursday, Sept. 15. He was part of a panel that discussed President Obama’s latest job creation proposals. Other panelists were Robert North Roberts, professor of political science and public administration at James Madison University, and Joseph J. Thorndike, director of the The Tax History Project and a visiting scholar in the department of history at the University of Virginia. 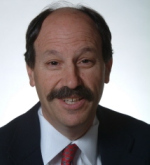 Goldsmith is a specialist in labor economics and is author of “Rethinking the Relation Between Government Spending and Economic Growth,” in the Spring 2008 edition of the Journal of Economic Education. Annie Howard, a Washington and Lee sophomore from Alexandria, Va., has entered the ING New York City Marathon on Sunday, Nov. 6, with Team for Kids. She’s hoping to raise at least $100 for every mile that she runs. If she succeeds, that will translate into a $2,600 donation to Team for Kids, which supports health and fitness programs. As of today, Annie has raised almost 60 percent of her goal. The funds will bolster free or low-cost school- and community-based health and fitness programs for children who would otherwise have little or no access to regular physical activity. Team for Kids serves nearly 100,000 children each year. You can support Annie at this link.